SINGAPORE, 24 January 2016 – A 52-year-old Irishwoman thought that her unforgettable family holiday to Australia via Singapore ended when she returned home to London last July. Little did she expect that a million-dollar windfall would be the icing on her memorable trip just a few months later. 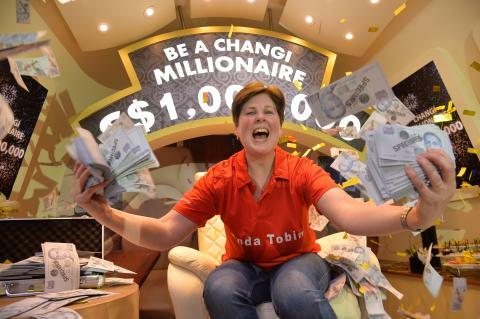 Today, at the ‘Be a Changi Millionaire’ Grand Draw held at Singapore Changi Airport’s Terminal 3, Ms Linda Tobin beat six other finalists to emerge the newest Changi Millionaire and S$1 million richer. The seven finalists of the ‘Be a Changi Millionaire’ promotion locked horns onstage and tried to out-luck one another in front of a ‘live’ audience of hundreds. The other finalists comprised three Singaporeans, one Indonesian, one Malaysian and one Briton. After three rounds of heart-stopping games and elimination rounds, it was down to Briton Tracey Tomlinson, 51, and Ms Tobin. In the final round, anticipation offstage hit a fever pitch, as both took turns to pick the correct half of a giant boarding pass, hoping to match the other half on stage. The correct match would open a cabin door and determine the ultimate winner. After a nail-biting seven tries by the two finalists, Ms Tobin picked boarding pass Number ‘3’ which proved to be the correct match, igniting a burst of confetti to declare her the winner. Ms Tobin and her mother visited her two brothers in Australia last July and were transiting in Singapore on their way home to London when she decided to purchase a bottle of Laphroaig 25 Year Old Islay Single Malt Scotch Whisky at Changi Airport’s DFS store as a surprise present for one of her brothers in Australia, to be given on her next visit. She had wanted to buy a gift on her way to Australia but didn’t manage to do so as her mother was tired after the long flight from London. Little did she expect that her ‘late’ present would turn out to be her winning ticket to her million-dollar dream. The promotion which comes with a grand prize of S$1 million in cash – the biggest cash prize to be given in a local retail promotion, or by any airport in the world – continues to be very popular among shoppers. The 2015 edition attracted nearly two million lucky draw entries from 229 nationalities globally. The top three groups were Singaporeans, Chinese nationals and Indonesians, with Singaporeans making up over one-in-three of the participants. More than 333,000 instant prizes were also given away to lucky shoppers. The instant prizes included a set of six exclusive premiums by local designers Wang Shijia and Jo Soh, which were specially commissioned to celebrate Singapore’s Golden Jubilee last year. In addition to the six monthly finalists, for the first time in the game’s history, one more shopper was picked from those who shopped on Changi’s online retail portal, iShopChangi.com. Ms Lim Peck Hoon, Executive Vice President of Commercial at Changi Airport Group (CAG) said, “We congratulate our sixth Changi Millionaire and thank our passengers and customers for their patronage this past year. We are delighted to achieve yet another record high for concession sales at Changi Airport in 2015. This is positive for the Singapore air hub as profits from our retail business help to offset the cost of our aeronautical operations. Since the launch of ‘Be a Changi Millionaire’ in 2010, CAG has made five lucky shoppers at Changi Airport overnight millionaires at its annual Grand Draw. The past winners are: Former deejay Ivan Rantung (2010) and business development director, Peh Hock Peng (2012), both from Singapore; an Australian engineer from Perth, Jessica Down (2011); an Indonesian business man, Irvung Tio (2013); and Japanese engineer, Oiyama Seiichiro (2014). To participate in the Millionaire Draw, passengers and visitors simply needed to shop or dine at Changi Airport, with a minimum spend of just S$30 in a single receipt. 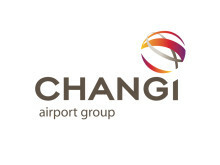 Purchases made in both the public and transit areas of Changi Airport were eligible for the Draw. Travellers who shop on iShopChangi got up to 10 times more chances of being picked as a finalist. Apart from Ms Tobin, the other finalists won S$5,000 in cash. They also received a three-night stay at Crowne Plaza Changi Airport, with airfare provided for non-Singapore participants. The seventh run of the ‘Be a Changi Millionaire’ Draw will kick-off in May 2016.